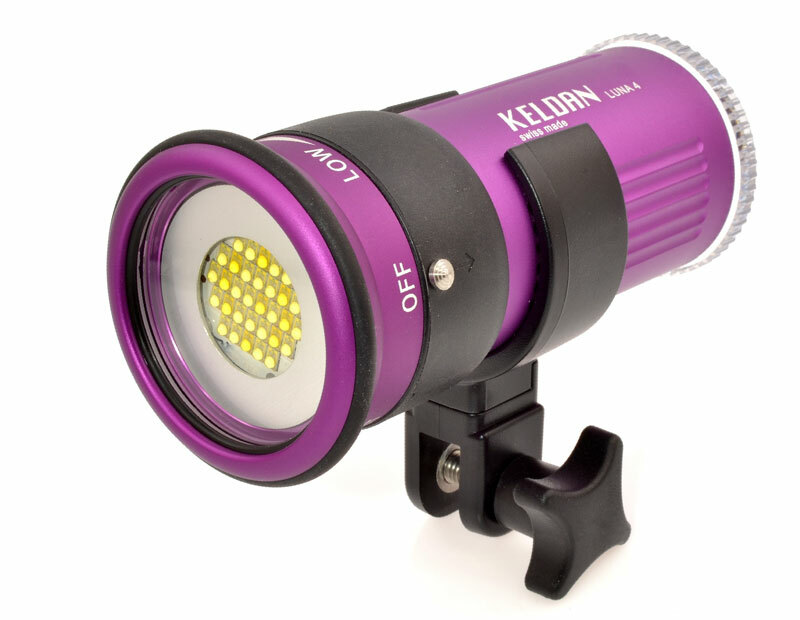 Not terribly long I go I reviewed the Keldan Luna 8 LA-V CRI LED underwater video lights and noted that they were characterized by a clean 5,000 Kelvin light temperature with the widest dispersion of any light I had used previously, a long throw and excellent burn time before having to recharge. These lights have since been upgraded with a new reflector and I look forward to getting them back in the water. If I was critical on any count it was that these lights were very large and heavy topside and took up far too much room in my carry on bag for international filming trips. Keldan, still distributed in the U.S. by Nocturnal Lights, producers of their own excellent underwater lights, has just introduced the Luna 4-V for underwater videographers. Unfortunately, the dive conditions in the San Diego area this past winter have been very poor and, thus, my testing was completed in a pool environment. Never the less, I was able to evaluate just what this little powerhouse of a light can do. 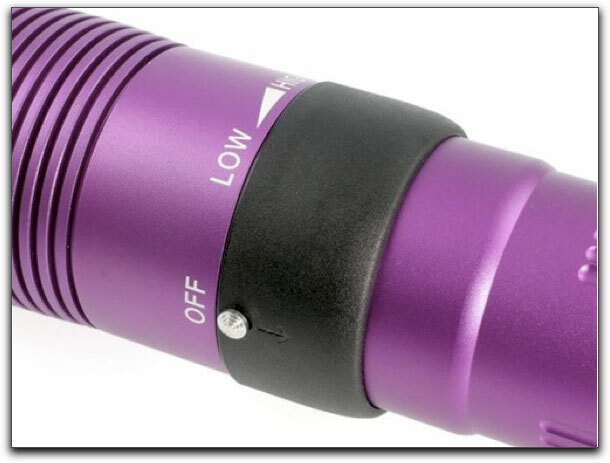 The barrel of the Keldan Luna 4 is made of the same anodized aluminum that the Luna 8 is made of and both the look and quality of build remain intact. 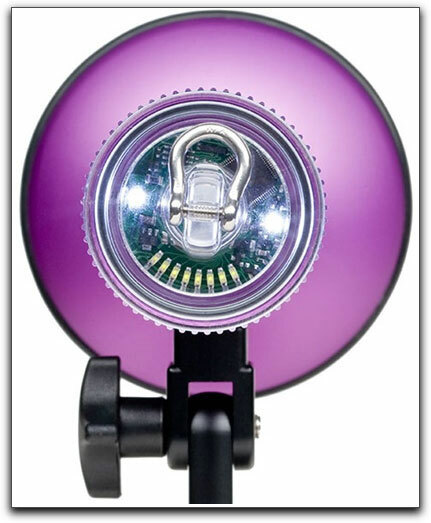 What is most obviously different is that the Keldan Luna 4 is roughly half the size and 2/3s the bulk of the Luna 8 CRI and therefore will take up very little room in your gear case. 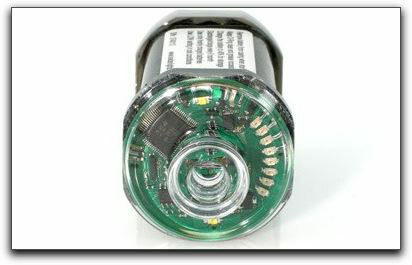 In addition, there is no potentially fragile rounded port on the front of the light as it is flatten and indented within a protective front ring. This lessens the weight of the Luna 4 to almost one pound less than the CRI 8, and is more convenient to use and less prone to damage when traveling without sacrificing quality. The Keldan Luna 4 has an underwater spread of 80°, only 10° less than the Luna 8, and 4000 lumens at maximum power equal to a candle power of 1,600. Like its kin, the Luna 4 has multiple power settings which are adjusted by a black ring on the main body of the lights supplying 11 to 45 watts of LED power. Turning the power ring clockwise incrementally increases the power output. From the off position, a turn counter- clockwise brings you to the light's 'Test' position where a series of 8 small LEDs on the back of the light show you how much of a charge you have left. This is a small but important feature for the underwater cinematographer who will now not be left guessing just how much of a charge is left on a dive; you can see in an instant. Burn time for the Luna 4 V is a good 50 minutes if the lights are used at full power for the complete course of a dive, and up to 200 minutes at minimum power. In practice, I never keep my video lights on continually and turn them on only when I am getting ready to film, which means for only a minute or so at a time when I find a good marine subject. 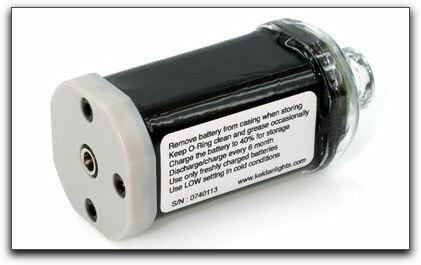 Using the Keldan Luna 4 V's in this manner equates to a full day of diving and filming without ever having to recharge or change out batteries for fresh ones. One would only use any video lights at full power for wide shots or for night time use. For medium and close up work, using them at full power risks blowing out the subject, and using the Keldans at their lower power options would be advisable. A battery recharge to full time is estimated at 3-4 hours and the AC power. The batteries are recharged by a small AC charger block. I definitely preferred these to the large blocks that came with the Keldan Luna 8 lights. When plugged in, the charger emitted a high pitched tone. I checked with Nocturnal Lights and they reported that the sound comes from the electric power supply turning on and off at a very high speed. I have never heard of this before but that is what was reported to me. The Keldan Luna V burns with a color temperature of 5,000° Kelvin producing a very clean light with no hotspots that I could see. It did appear to me that as I lowered the power setting the color temperature seemed to warm but I cannot say that the temperature changed with absolute confidence or by any scientific testing method; it was only to my eyes that this appeared to be the case. 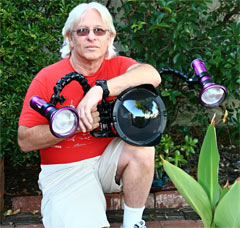 Unlike many underwater video lights, the Luna 4 can be used outside of the water which then increases its spread to 110°. I love that the Keldan is also a self contained light so that you do not have additional cables or battery pods to lug around. When I first turned on the light, the Keldan Luna 4 V amazed me at just how much beautifully clean light this produced. I immediately thought to myself, "I wonder if they would trade these two lights for my Keldan CRI ones." It's not that I don't love the Luna 8s, but these would be so much easier to travel with and the small decrease in dispersion and power would make it worth my while. Well, that was only a thought but it translates to a very strong recommendation. The build quality is excellent and feels sturdier than any other light from any other manufacturer of underwater video lights I have seen. For almost a thousand less than the Keldan Luna 8 lights, you retain performance and can now afford to upgrade out of economy on the 20 hour flight to Indonesia.